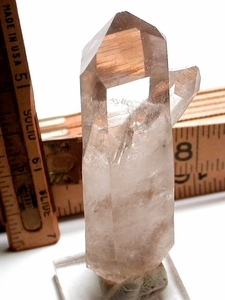 This gem grade tabular natural smoky quartz point with 8-edged channel face, devic veils, rainbow, and tabular penetrator crystal with 7-sided channel face comes to you from Garland County, Arkansas and so is rare, thus. Cabinet: 5/8x 1-1/4x 3". Recordkeepers. A tiny back tip bing and an uncommon 7h face to the smaller crystal.